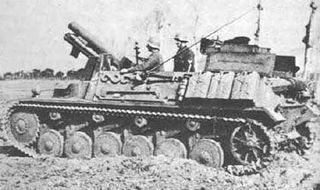 The Sturmpanzer II is a German tier 4 self-propelled gun. 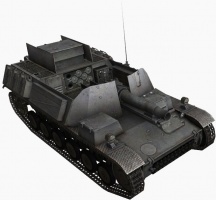 Developed in 1941 and based on the Pz.Kpfw. II Ausf. B. All manufactured vehicles were sent to the front and lost. 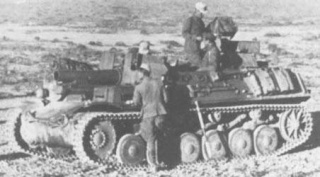 The SPGs were used by the Afrika Division in Libya and Tunisia. 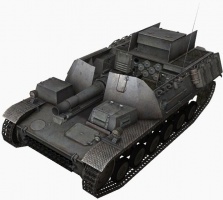 It uses the same gun as the Sturmpanzer I Bison, although it has more than twice as many shells and a better rate of fire. 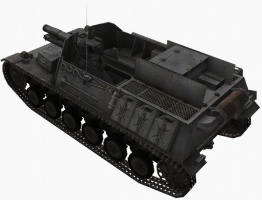 Despite looking significantly different from the Sturmpanzer I Bison, the Sturmpanzer II has many of the same statistics. The extremely narrow horizontal arc and unimpressive range make it necessary to move this vehicle frequently, which can be annoying due to the long aim time and risk of being spotted. 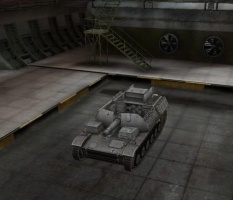 However, these balance the vehicle, as the gun is extremely powerful, capable of doing very large amounts of damage to even some tier 6 enemies. 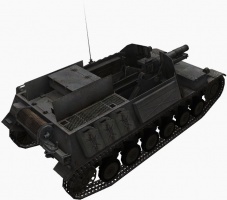 The Sturmpanzer II leads to the Grille. 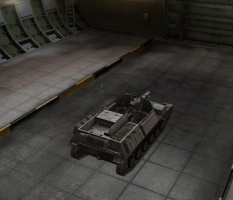 When fully upgraded, this SPG can reach a decent max speed to reach its firing position much more quickly than the Bison, though its traverse speed is a major handicap. Its traverse speed and slow reload time also make it extremely vulnerable in close quarters fights, making support or excellent positioning essential. 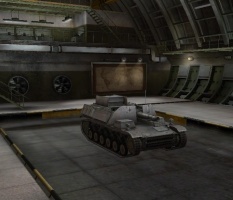 When facing high speed tanks, it is recommended one takes a very large lead on the target. Ideally, this SPG should not even attempt to hit these targets, as hitting the right location at the right time is very difficult when having to frequently turn the vehicle. 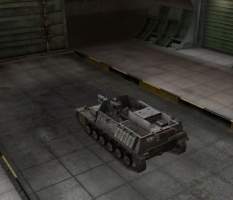 When facing lower speed tanks that are moving, it is recommended to center the tank facing the targets and then lock the track. Otherwise, very minor aim adjustments will often result in very large aiming penalties. First, research the Büssing NAG L8V/GS 39 engine. Next, research the upgraded suspension. Lastly, research the FuG Spr. A radio. This page was last modified on 19 July 2018, at 17:14. This page has been accessed 206,496 times.